At Brighter Homes Lighting Gallery, we offer a truly staggering amount of lighting products, both interior and exterior, in our massive showroom. We have lighting products for every single occasion. However, seeing so many choices and options can leave people feeling overwhelmed. How do you choose from such incredible variety? One thing we like to do is to determine what kind of mood or atmosphere you’re shooting for, and then take it from there. For a lot of people, a rustic, country-esque outdoor space is something they crave for their porch, patio, or yard. In this blog post, we’ll explore exterior lighting solutions that help you to create a rustic atmosphere that speaks to you. In an age where screens, fluorescent lighting, and technology constantly intrude on our lives, it’s nice to have an area that calls back to simpler times, helping us to feel more relaxed. Here are some tricks to establishing a rustic tone. One of the best ways to achieve a rustic feel is to use vintage bulbs that have a dull glow in their filament. We’re talking about the bulbs that are crystal-clear, to which glow with a subdued yellow-orange color, more reminiscent of a candle than the bright bulbs that we’re used to. Most bulbs are practically blinding if you stare right into the filament. If your bulbs look like this, you don’t have the right ones for a rustic atmosphere. You should be able to stare directly into the flowing filament and not be bothered. These lights are much less effective at lighting a large space, but that’s kind of the point in a rustic setting — it’s not a lightshow, and you shouldn’t treat it like one. If you’re shooting for a cozy, country feeling in your outdoor space, we can’t think of a better option than string lights and lanterns. Both of these lighting types hearken back to simpler times where we weren’t overwhelmed with modern technology. Lanterns are an obvious candidate — this was how people illuminated their spaces before electric lighting, and even if yours is using an electric bulb, a similar effect is achieved. String lights wouldn’t be called elegant by most people and would feel out of place in a smooth, modern setup. But if you want something that’s a little more rough around the edges, evoking comfortable country life, these are a perfect option, though you’ll want to be sure you fit them with the vintage bulbs that we mentioned in the point above. Finally, it’s important to remember that less is more when it comes to vintage lighting. People in older, simpler times weren’t overwhelmed with lighting options. They put light where it was needed, and didn’t bother with excess. This is what you want with your rustic exterior lighting — enough to illuminate the outdoor area you’re in, but subdued enough to where it’s noticeably dimmer than what bright modern lights would achieve. 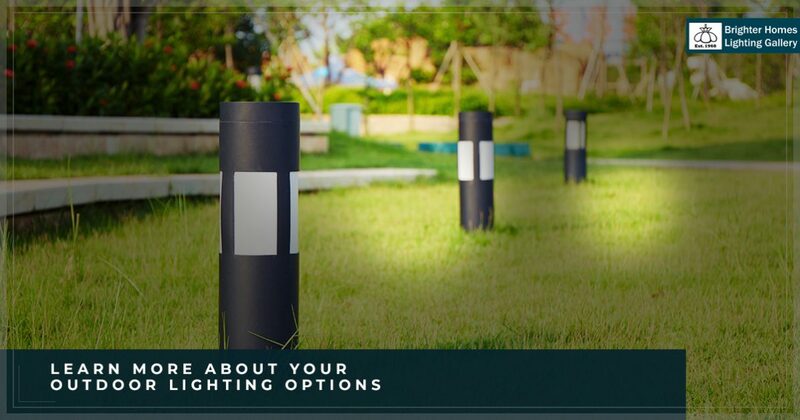 When it comes down to it, your indoor and outdoor lighting solutions have a profound, reaching effect on the tone and atmosphere of your home. If you’re feeling overwhelmed, pick a “mood” you want to shoot for, and see how you can use creative lighting implements to achieve that! If you stop by our lighting showroom in Eugene, our team of experts will help you to make the perfect decisions for your yard, porch, patio, balcony, or yard. Contact us at Brighter Homes Lighting today!